I don't mail out a lot of Easter cards, but I do send our daughters and their families little Easter gifts and I like to make cards to go along with them. This year two of the three families were with us for Easter and these are the cards we made the adults. 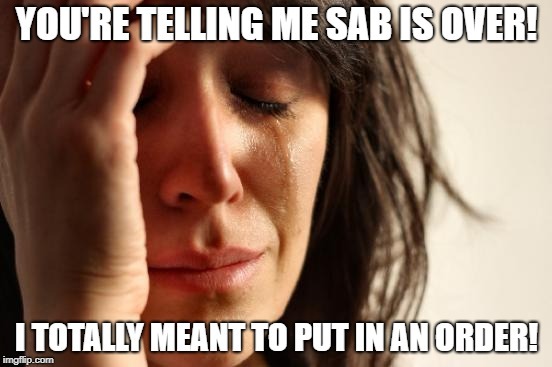 Check back here on Friday for the cards I made for the grandkids. 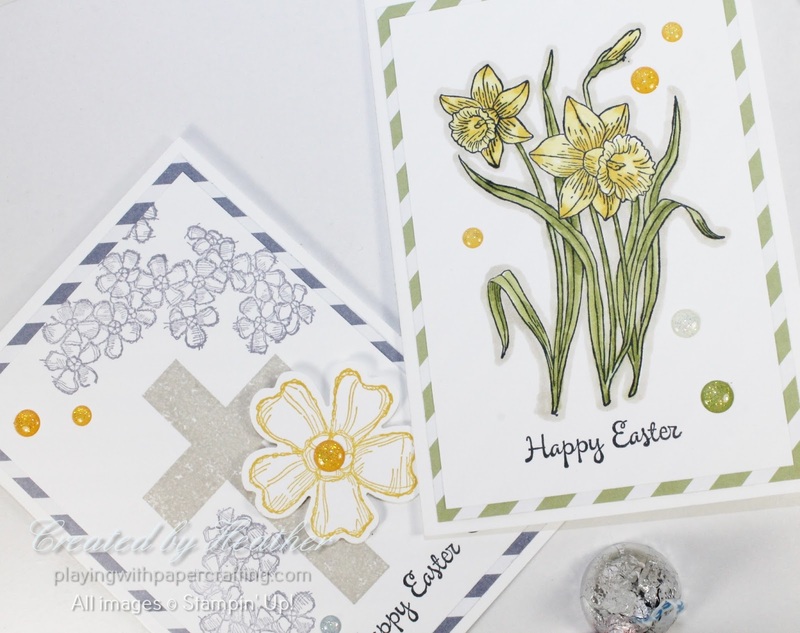 These two samples were made using Whisper White Notecards & Envelopes as the card base, which makes them a little easier to complete, since the notecard size is 3 1/2" x 5". The background Designer series paper is from the now retired Subtles Designer Series Paper Stacks, using the stripe pattern in Wisteria Wonder and Pear Pizzazz. 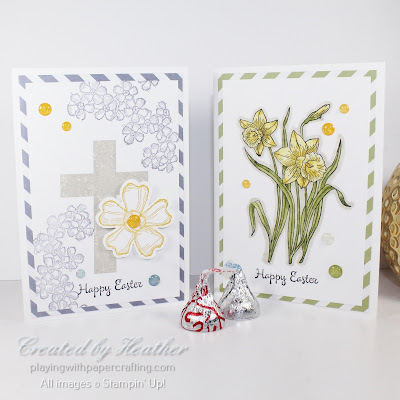 The Wisteria Wonder card on the left uses 3 stamp sets: Birthday Blossoms for the flowers, You're Inspiring for the sentiment and Hold on to Hope for the cross. The Pansy Punch is used to punch out the large blossom shape. The card on the right just uses the You're Inspiring stamp set for all the images and sentiments. 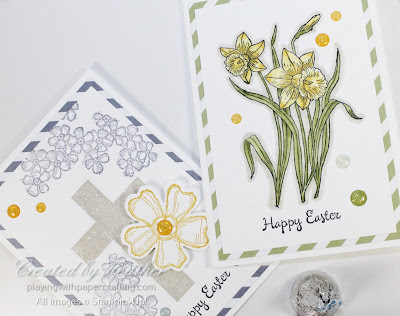 They are stamped using Memento Tuxedo Black ink so that they can be coloured in with the Stampin' Blends Alcohol markers - bloth shades of Daffodil Delight and both shades of Old Olive, and the light shade of Crumb Cake. 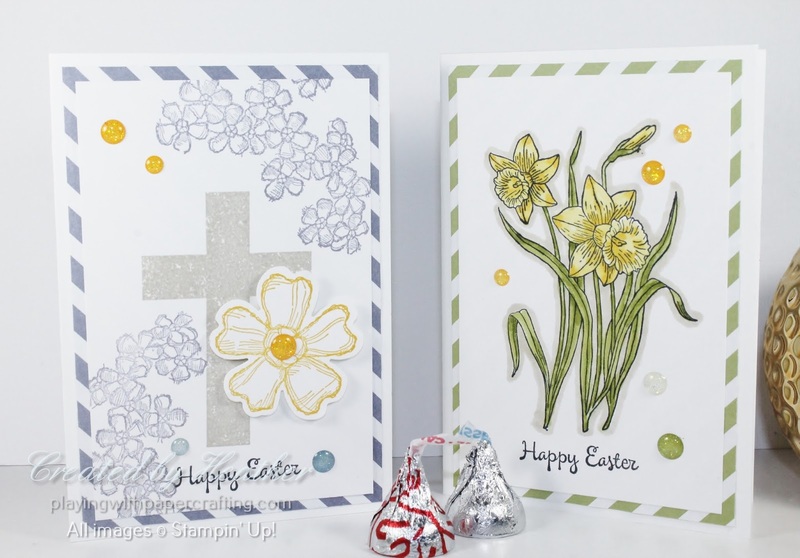 Due to long lead times with the manufacturer of Stampin' Blends and unprecedented demand for them, Stampin' Up! has had to remove them from the available to order list until about the end of May, in order to catch up on backorders and to stock up enough to meet demand, so you'll have to be patient for awhile if you don't have yours yet. Both cards were finished off with Glitter Enamel Dots. Friday is the last day to get me your orders if you want to take advantage of Sale-A-Bration, and Saturday is the last day to submit your own orders through my On-Line Store. Remember, you need to have earned a Sale-A-Bration reward during this Sale-A-Bration period to be eligible to receive an invitation to my exclusive "invitation only" party, Celebrate Sale-A-Bration, in April! It's going to be a blast and you could win door prizes of other Sale-A-Bration rewards, so make sure you're on that list!